Stock prices are leading analyst estimates again, this time in a positive direction. 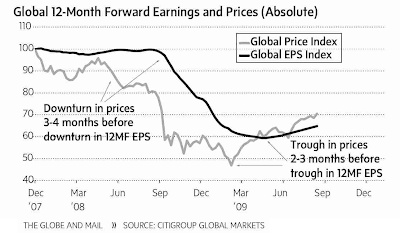 The charts above show that earnings estimates, in aggregate, provide something like a smoothing function to underlying price action. Estimates lag prices by roughly three months and don't exhibit as much volatility as prices. This interaction of prices and estimates does seem to mark turning points in the stock market. Sources: this post is based on an article in Toronto's Globe and Mail.